Our Company offer a full design service for printed artwork formats. Our in house staff assist throughout, helping businesses design unique artwork formats. 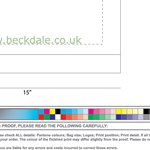 To start designing your choose by material or similar , please contact Beckdale via the above details.